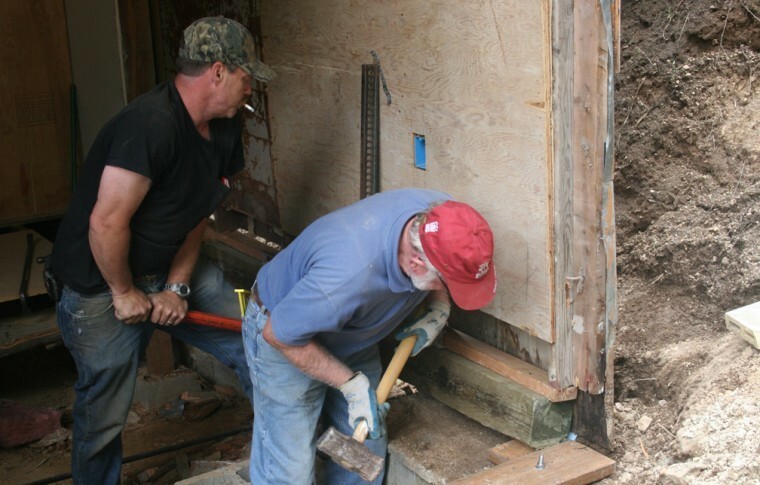 MULLAN – A mixture of laughter and the thuds of sledgehammers drifted out over Mullan Monday as volunteers for the Fuller Center for Housing united with RV Builders from across the nation. Their mission is to spend two intensive weeks finishing up renovations that began January in a Mullan home on Dewey Street so that it may be ready for its new owner, Amethyst Pelham. Judging by the enthusiasm and diligent work displayed by volunteers Monday, this will be no mission impossible. "We were here last year and we really fell in love with the community," said Audrey Ussery of Lompoc, Calif. "The community was very friendly and they really needed some help building." Audrey and her husband Bernie are members of the RV Builders, a group of volunteers who mosey cross-country in their recreational vehicles, jumping from one build site to another within Habitat for Humanity. The (Silver Valley, Idaho) Fuller Center for Housing, formerly known as the Silver Valley Habitat for Humanity, invited RV Builders to visit the Silver Valley for their Mullan project. Following a welcoming potluck dinner Sunday, volunteers dove right into the project Monday.